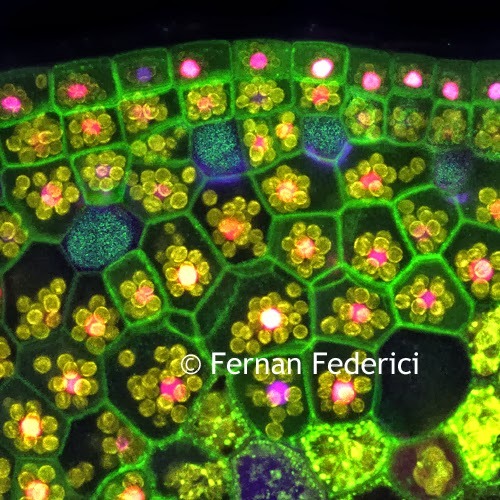 Fluorescence microscopy is a technique used to study specimens that can be made to fluoresce. Certain specimen materials emit energy detectable as visible light when irradiated with the light of a specific wavelength. The sample might be fluorescing in its natural form, or it can be treated with fluorescing chemicals. A fluorescence microscope lets excited light radiate the specimen and then sorts out the much weaker emitted light that makes up the image. The fluorescence microscope has a filter that only lets through radiation with the desired wavelength that matches the material that is fluorescing. The radiation collides with the atoms in the specimen and electrons are excited to a higher energy level. As these atoms relax to a lower level, they emit light. In order to become visible, this emitted light is separated from the much brighter excitation light in a second filter. The fluorescing areas can be observed in the microscope and shine out on a dark background with high contrast. 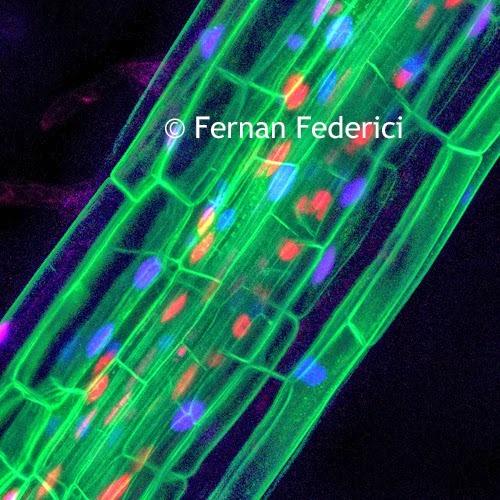 The images below are stained plant tissue that were captured using a fluorescence microscope by Fernan Federici for Cambridge University.